I'm a fan of Charlotte as much as the next person (or Pig) out there, and I know all the good things they do, but unfortunately, spiders this big just don't belong in people's bathrooms. Especially not when they first wake up in the morning. It just goes to show how much I love my husband, and how tired I knew he was, that I did not go running and screaming back into the bedroom and wake him up to save me. Instead, I emptied half a can of bug spray onto the poor creature. I practically asphyxiated myself in the process. I don't think that much bug spray is supposed to be released in a room that's 8' x 4'. I really am not that squeamish, and I don't have a phobia of bugs or spiders. This picture just doesn't do justice to how large this creature was, with all of its legs extended. At least four inches diameter, I would guess. A weekend at the beach investing in student leaders....who could ask for more??? I love that I can be a full-time mom and yet still do things like this. I love that Dar es Salaam has so many great beaches. I love that these six are from six different countries: Tanzania, Madagascar, Italy, South Africa, Switzerland, and U.S.A. I love that HOPAC supports these kind of events. We spent many hours planning events and talking about leadership, but there was also lots of time for fun. My favorite part of the weekend? Three hours on the beach with three beautiful girls, talking about college, guys, dating, adoption, dreams, and standing firm for Christ. You knew the importance of your food being fat free, but I bet you never knew that your dishes, too, could be fat free. It's going to be the new weight-loss craze; I just know it. There's a dairy company in Tanzania that has a partnership with the Netherlands. That makes sense. Dutch=Dairy. I get that. What on earth does Alaska have to do with eggs? As far as I know, Alaska is not known for their egg production. Did they have incredible amounts of egg knowledge to share with this poor third world country? Did the government of Alaska give a grant to Tanzania to assist with their egg production? Is Alaska shaped like an egg? Did the owner randomnly point at a map when choosing the name? Are they hoping all the Alaskans that live in Dar es Salaam will choose their eggs instead of others? I will wonder every time I buy these eggs, and I will probably never know. But at least I will know that these eggs are "as fresh as they should." Because we all know, that's pretty important. But I will also think of my friend and Alaska-dweller, Wendy, every time. And so this post is in honor of her. Oh--and one more thing you should know about Tanzanian eggs. See the "Yellow Yolks" declaration? Well, that's to distinguish between the "white yolks." Bet you didn't know that egg yolks could be white. But oh yes, they can be. Yellow yolks is what helps you know that the chickens have been fed more than, say, dirt to eat. So I am happy to pay extra for yellow yolks. So even though I am sure our eggs are usually "organic" and "free range," the label I look for is yellow. It never fails. And every time, it cracks me up. Whenever we have teams come, or visitors from the States, they sit in our living room in their groggy, jet lagged state. And the first time the cameras come out is for the geckos on the wall. And I think to myself, "There's a gecko on the wall? Oh...yeah, I guess there is." There are geckos on the walls every single day, probably at every hour of the day. I just don't see them anymore. Well, unless one gets smashed in the door jam. Or if I open a cabinet and one jumps out at me. But I've been thinking. Most of my posts recently have been about adoption, or parenting, or HOPAC, or the kinds of things grandparents want to see. But I haven't done much recently about Tanzania. And I suppose, that's because after 8 1/2 years, Tanzania hasn't seemed interesting enough to write about anymore. Because it's just normal life. And isn't it like everyone else's? "The Interesting and The Amusing in My Daily Life." I hope you will be interested and amused. She had a very good Five. Did all the things Fives are supposed to do: Two teeth came out, the training wheels came off, to kindergarten she went. So Six was celebrated with her new kindergarten friends, princess dresses, and lots and lots of pink. It was a good day! 2. Don't waste hours of your time laboriously cutting the sandwiches into cute little shapes. All they are interested in is the cheese balls. 3. Don't waste hours of your time coming up with games. Because all they want to do is play outside with the puppies. 4. Make twice as much frosting as you think you will need. And then make more. Especially when your oven isn't level, resulting in layer cakes that are slanted. (Extreme amounts of frosting also make up for lack of cake decorating ability). Rockin' out in the ballroom. Can I tell you how much I love this girl? She is a total extrovert; friends with everyone and enthusiastic about everything. Flexible, adaptable, cooperative, and always happy to be helpful. An amazingly kind and patient big sister. Kindergarten has only brought out more maturity and responsibility in her. Since my other two are...er...not quite so easy, I am extremely thankful for my big girl. Of course, she has her moments, but most of the time she is completely delightful. A very Happy Birthday to my Sweetie! It feels like a miscarriage. I had that happen once. It's not the worst pain in the world; it's not the worst tragedy. It's just so disappointing and sad. Probably the hardest part is knowing that James' future is so uncertain. He can stay at the baby home until he is five; then he will have to transfer to a children's home. Some of them are pretty nice places. Some of them. And then what happens when he is 18? What happens to any orphan when they are 18? So I pray for a family for him. I pray that God works in the hearts of Tanzanians to turn them to adoption. There are some, of course, who are willing to brave the social stigma of having an adopted child. But only a precious few. And I pray that God changes the hearts of those who have the power to change adoption laws in this country. In the last years, the laws have gotten more restrictive, not less. Last year, the law was changed to say that any foreigner has to live in this country for three years before they can apply to adopt a child. And just recently, new regulations have been put in place that restrict the number of adopted children in a family to three. And that is why we cannot bring home James. 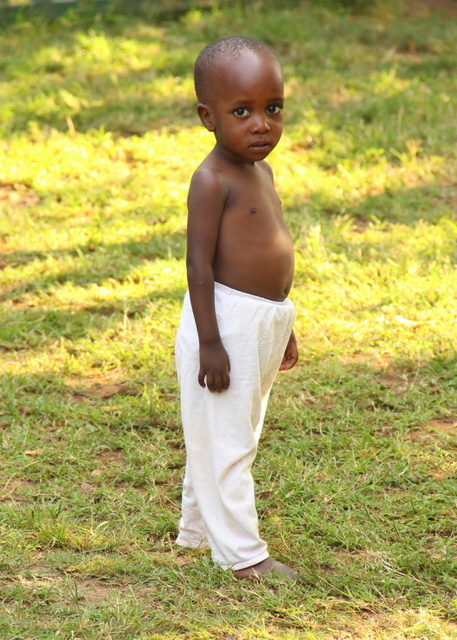 And not only James, but we will not ever be able to adopt in Tanzania again. Of course, there are millions of children in other countries who need families, and we will be praying about that and considering our options. But how sad, how completely sad, that in a country of 3 million orphans--a country we love and cherish--that we cannot give at least one more child a chance at love. There are many, many things that have happened in these past months, or even these past five years of our adoption journey, that could make a person very bitter and cynical. But I am choosing to remember that God is sovereign even over governments and the hearts of men. His plans are greater than mine. James was found beaten and bruised, with scars on his tiny 15 pound body. He was brought to Forever Angels on February 10, 2011 and subsequently given that birthday. Same as Lily's. Exactly one year younger than Lily. We want him for our family. We think he would be a perfect fit. Normally, I would not post such personal details about a child for everyone to see. Because it's James' story to tell. But I'm doing it because I want to ask you to please, please pray that God will bring a family for this precious, beautiful little boy. Because it's not going to be us. And of course, as any of you know who have read recent Christian books, counting to three is anathema. Tantamount to something like.....high frutose corn syrup. If you count to three, your children will certainly end up doing drugs. Yet, interestingly enough, this friend of mine has three wonderful, godly children. One of them has a PhD in ancient languages, or something like that. They are certainly not hobos. And you know what else? They went to boarding school. Why do I think that again? Because everybody does. And everybody knows that's what you are supposed to do. Of course, there are reasons. Backed up by five explicit points of Scripture. Of course. Which I then should have my children memorize. Don't you think the missionaries of the past backed up their parenting choices with Scripture? I have struggled a lot these past five years as a mother. You’ve read about some of it here. And I have made some progress. Yet still, for a long time, was this burden of guilt on me. This feeling that I just wasn’t getting it right. That if only I did more crafts, or more read-alouds, or taught them more Bible verses, or the names of more countries—then I would be a good mom. Because, it seemed, that’s what everyone else was doing. But recently I read an article that really changed my perspective. It’s called The Seven Blindspots of Homeschooling by Reb Bradley. First, let me give a disclaimer here: I think homeschooling is great. By posting this link, I am not intending on criticizing homeschooling. I have many, many friends who homeschool, and it’s possible that if we ever live in the States, I could join those ranks myself. It’s one of the reasons I got a teaching degree. Now, currently I think I would be compelled towards public school for my kids (more on that some other time), but that’s not to say that I would never consider homeschooling. There are biblical parenting principles, but they are pretty basic: Love unconditionally. Teach obedience. Disciple. Build relationships. And then what? Your kids will be perfect? Then you leave the rest to God. And His sovereignty. And His work in their lives. Because no matter how much I train, how much I discipline, how much time I spend with them, how much I shelter, there are no guarantees. And that is why a parent who homeschools her children from K-12 may have a child who turns out to be a godly gem, and a parent who prayerfully, tearfully sends her child away to boarding school at age 8 may also have a child who turns out to be a godly gem. Or on the other hand, the opposite could happen in either situation. Reb Bradley gives plenty of examples. The truth is, there is freedom. Freedom to prayerfully choose how I want to discipline, and to what extent. Prayerfully choose how I want to educate my children. What I want them to wear, how much media to expose them to, who their friends are. I can look at my own personality, the situation of my family, my children’s dispositions….and I can choose. Probably because, I assumed that those rules were supposed to “work.” So reading this article was like heaving a huge sigh of relief. Oh. Those rules don’t necessarily “work” after all. I don’t need to worry. Or feel guilty. And then I remember….Oh yeah, I went to boarding school too. For my 9th grade year. My parents were in Ethiopia; I went to Kenya. I don’t know who cried more—my mom or me. We didn’t feel any pressure for me to go—we just both knew that it was the right choice. And it was hard. I cried a lot. There was no internet back then. I got to talk on the phone with my parents once a month. My mom and I handwrote letters to each other each week. But you know what? It was one of the most incredible times of my life. Not necessarily fun. But my maturity grew in leaps and bounds. My faith in God became my own for probably the first time. It was, certainly, one of the best things that happened to me. Amen. May I remind myself of that daily as I seek to do my job well, without any regrets, and yet ultimately know my children are in God’s hands. A lot of people at Christmastime travel to the tropics. But we in the tropics? We travel to the mountains. We want the cold. 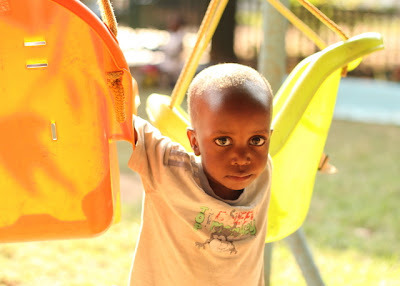 And in Lushoto, a town about 7 hours away from us, is one of our favorite places ever. Like last year, we were blessed with such an amazing week. There's never that much to it--just reading (this year was The Hunger Games trilogy for me), playing games, hanging out with excellent friends. Eating great food that I didn't have to cook. Kids playing outside all day. Enjoying the beauty of the mountains. And wearing sweaters. Grace had her birthday in Lushoto, but we didn't do a party there this year, since she wants to have one with her friends from school (which will happen next weekend). But Daddy couldn't let the special day pass without some fun, so he created a Treasure Hunt that took them all over the lodge. Like I said. Best Daddy Ever. And he had his own fun by playing soccer with the locals every evening. With his miniature Buzz: His favorite Christmas present. New Year's Eve Dance Party. Thankfully, Daddy did not put his arm through a window this year. Gil got to play football every evening, and use his new macro lens every day. He was in heaven.